I have a 14 wk old caique. He has been very playful and energetic. Put him to bed last night all was well. He went in his hut and went to sleep. This morning, he is having difficulty walking. He can get around by scooting and pulling with his beak. Veterinarian's Assistant: I'll do all I can to help. Could be a lot of things that cause lethargy. The Expert will know how to help the bird. He really try’s to interact. He will eat and drink if you hold the bowl for him. Veterinarian's Assistant: What is the bird's name? Veterinarian's Assistant: Is there anything else important you think the Veterinarian should know about Bugsy? I'm Dr. Jo and I'm here to help you with your question about Bugsy. I'm so sorry he isn't doing well, but glad you're looking for the information you need. I'm really worried that he's experienced a severe injury somehow overnight. It's also possible that his blood sugar is really low. Has it gotten any better since he's eaten? We have moved his legs and wings and checked him over he is not giving any indication of any pain or discomfort he flaps its wings is able to grasp with his legs. He has eaten some seeds he still wanted to try to climb up on my finger. I don’t know if I could say that he has greatly improved since 9 o’clock this morning, but he is trying to interact. What could I give him to boost his blood sugar? What a cutie! That's a good sign, but he's still squatty, low, and off-balance, yes? I wonder if holding off on the fruit for a couple of days, cause the problem. Is that a possibility? Does he require a good amount of fruit every day?His energy level seems to be getting better, even though he is off-balance. Then at this point, unfortunately, we know it's not just low blood sugar. Have you done your detective work? Anything look like it got chewed up or otherwise alarmingly gotten into? Missing the fruit would only likely be the cause if he was essentially starving without it. If he was still eating other foods well and producing lots of droppings, that's ruled out. I cannot think of anything that he has gotten into. We had one of those bird protectors on the back of the cage, that prevents mites and such in the cage. He does not have access to be able to tear into that, although he hangs on the side of the cage and packs at it. I cannot think of anything that he has gotten into. We had one of those birds protectors on the back of the cage, that prevents might and such in the cage. He does not have access to be able to tear into that, although he hangs on the side of the cage and PAX at it.Sorry about the duplication I don’t know what happened. Hmm.. The little devices that smell like mothballs are actually not at all medically necessary or effective. There are occasional reports of birds reacting poorly to them, although most birds tolerate them okay. I doubt this is associated with his current trouble, but I always advise throwing those away. Inhaled toxins are a problem for birds as well. Overheating Teflon is a big one. If that were the case, however, I'd expect all the birds in your house to be having problems, and I think you mentioned you also have parrotlets. we have for parrotlets with no problems. He’s really doing is best to get around and seems to be getting a little more stable although he tires easily. I'm glad the other birds are okay. Birds are masters at hiding signs of illness as a rule, and by the time even the slightest symptoms are apparent, it usually means things are reaching a crisis point. The first aid you can provide at home is what you're already doing: providing extra calories and making sure he's warm and not fluffed. It's super unfortunate that the bird vet isn't available until Tuesday. If at all possible, it would be best to find another one, even if that means a bit of a drive. You're doing all you can for him at home. If this doesn't do the trick, he definitely needs medical care. I'm so sorry I don't have a simpler solution for you. You're welcome. I'm sorry there isn't more we can do. He seems to be gaining some ground. Not a lot of stamina, but can walk and move freely for short periods. Chirping and interacting. We will see how this goes through the night. I so appreciated your help today and wanted to keep you in the loop. Yes, thank you for letting me know. I'll be hopeful he continues to get stronger. We took him to a vet today that we were told was a bird veterinarian, but the young lady was not an exotic bird veterinarian. She stated that she thought bugsy had a cleft palate. She thought that the additional noise in his voice was from a possible aspirated seed. She thought that he might need to have surgery to close his cleft palate or have to be fed with a tube for the rest of his life. From what I’ve read all birds are supposed to have a cleft palate. We have an appointment tomorrow morning with an exotic parrot veterinarian. 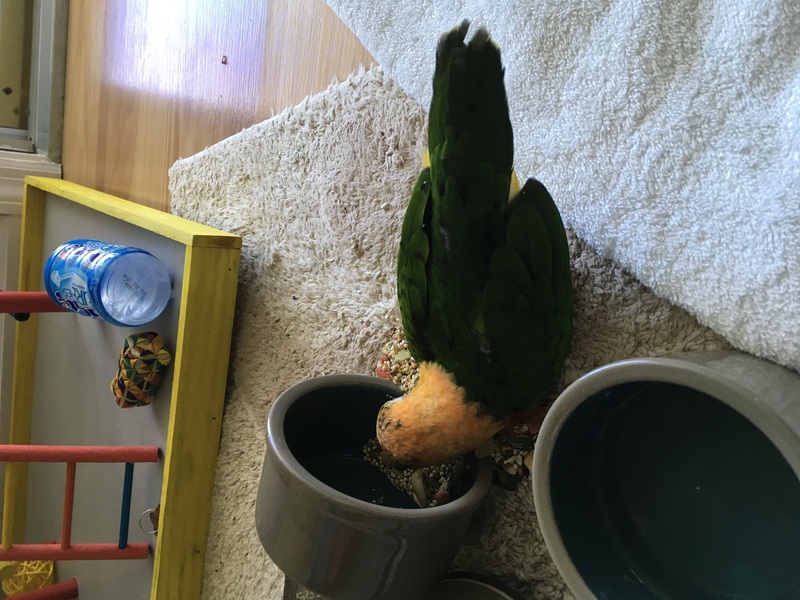 We have been giving him access to seed, but we started also feeding him formula to make sure that he was getting good nourishment, a recommendation from the pet store where we go him. I am in Florida and will be up for another hour or so if you would like to call and chat. My number again is(###) ###-#### Thank you so much for your concern and your follow up. It means a lot to us. You do not need to call me if I’m going to be charged for another expert contacts. Hello, and sorry for my delay. OH, no... yes. All birds have a split in the roof of their mouths. It's called the choanal slit. I'm so sorry this veterinary visit was not helpful. Please have a look at the information in this article. It's from a reliable source. We lost Bugsy early this morning. We are heartbroken. Thank you again for you help and support. The avian specialist suspects clChlamydiaWe will know more when the test come back. Oh, no. I am so very, very sorry to hear this. Such devastating news. I'm glad you're having post-mortem testing done. It's important to know why. The tests were done yesterday while he was still alive. They did x-rays in a full blood work up. The pet store where we got him, said they will go ahead and pay for the lab work to go ahead and be forwarded so that they will know what happened as well. Obviously, they have other birds to be concerned with. Ah, I understand. Yes, this is very important for both you and the pet store. Even though it hurts to lose Bugsy, it's important to get answers, especially when there's a potential for infectious disease. Can we get this as well. Chlamydia can possibly be spread from birds to humans, yes. It's not super common, but it is possible. Yes, it's a good plan. But there's no reason to be especially alarmed if no one is acting sick. While it can occur, it is not common. Usually by the time a human gets diagnosed with it, they've been sick with respiratory symptoms that they assumed was a cold for several weeks. That means there's nothing for you to get checked out with for yourselves in a hurry. Again... my condolences. I'm so sorry. Called the clinic and left a messageWe have been crying all dayThe veterinarian yesterday also said that he had bruising around his jaw and around his eyes that could have been from hemorrhaging. We never saw any blood, but she stated depending on the condition that he had he could’ve just been bleeding into the tissue around his jaw and eyes.Also the urine was yellow in color and not clear. His feces was more solid since we put them on the formula. My heart goes out to you. This is such a tragic loss. Thank you for understanding. I'd really appreciate hearing what you learn when the report comes back. I'll be thinking about you in the meantime. My yellow budgies upper beak seems to look unhealthy/discolored.